The Pound lost its current bullish momentum, after a lack of major breakthrough from cross-party talks, and an upbeat data from the US put pressure on the Sterling. Traders will get less Brexit headlines starting today until April 23, as the British parliament is on a recess. Market participants will turn their focus on macroeconomic factors until Brexit headlines resurface. There are no economic data coming out from the UK today, so we expect a slow trading day on the GBP/USD. 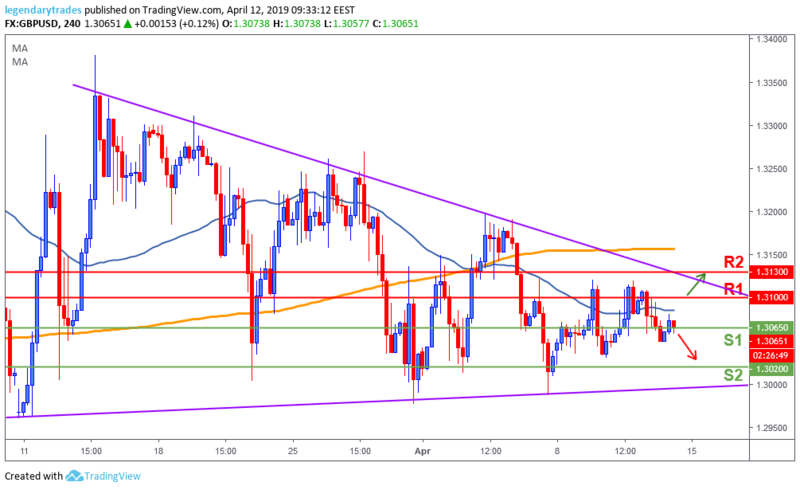 For the past couple of months, the Pound formed a triangle wedge formation (purple lines) and price has been consolidating inside of it. The Sterling will remain trading with no clear bias until a breakout to either side occurs. 1.30 and 1.3150 are key levels to watch. A break to either side will probably start a new trend in this market.